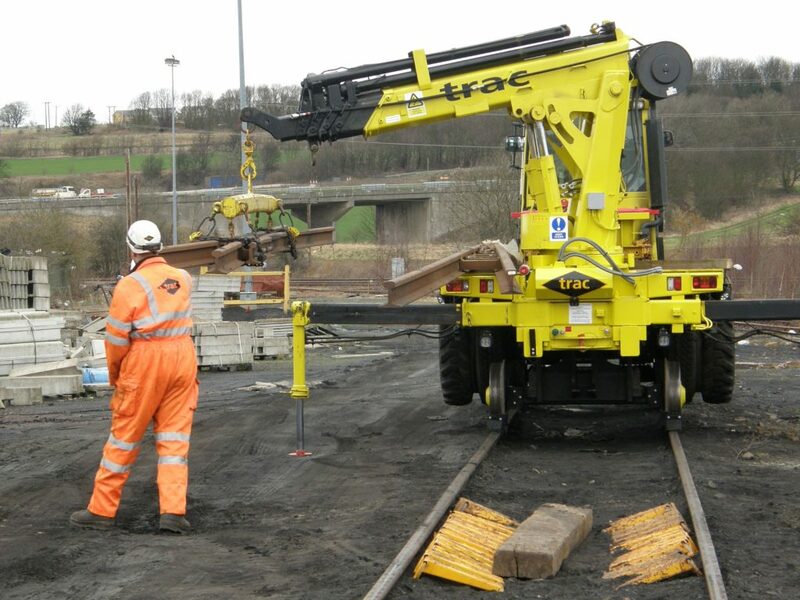 TRAC Rail’s TD12 Heavy Lifter is able to access, travel and work under LIVE OLE. Crab Steer enables ease of access and manoeuvrability when on tracking. Lifting and carrying operations are used either with the base machine only or with both the machine and rail trailer provided. The purpose built lifting cradle enables level lifting and decreases load swing. The machine is capable of carrying 10no 60 foot lengths of rail at any time or 2no half switches. In addition, the machine has a carrying capacity of 10 tonnes with a towing capacity of 26 tonnes. Lifting operations are carried out using the fully remote controlled crane that can rotate through 360 degrees; restrictors enable operations under LIVE OLE. When at full reach of 9 metres it is capable of lifting 1 tonne. The TD12 with rail trolleys attached are capable of lifting and moving S&C, IBJ’s, Scrap recovery, 60ft or closure rails. The rail is loaded from either CESS or 6ft, can also be lifted out of the 4ft with crane attachment. Up to 20 x 60fts or scrap rails can be loaded and distributed in any one run.